A new branch of the Haus der Geschichte (German History Museum, Bonn). This one is in Germany's capital city Berlin and concentrates, as the title suggests, on everyday life in the former GDR, including its darker aspects, such as repression by the Stasi, shortages, socialist propaganda, etc. What there is to see: Lots and lots of artefacts from the GDR era grouped into a series of themes. The text panels providing explanations also have translations into English, but quite a few items on display have writing on them too, and that's obviously almost always in German only. Still, it's laudable that international visitors have not been forgotten here. Even so, you will get more out of this museum if you are familiar with both the German language and a bit of GDR history too. On arrival in the foyer of the museum, I was greeted by a museum employee in a friendly way, but the main point of this is to explain that bags, including handbags, have to be stored in lockers. Also in the museum foyer is a fairly well-stocked museum shop with plenty of books, brochures, postcards and other thematically related items. Well worth a look afterwards. The main permanent exhibition starts to the left of the entrance and kicks off with a veritable onslaught of socialist propaganda posters and two glass cabinets with busts of communist big shots, both international (Marx, Lenin et al.) and from the GDR (e.g. Walter Ulbricht, Otto Grotewohl, etc.). 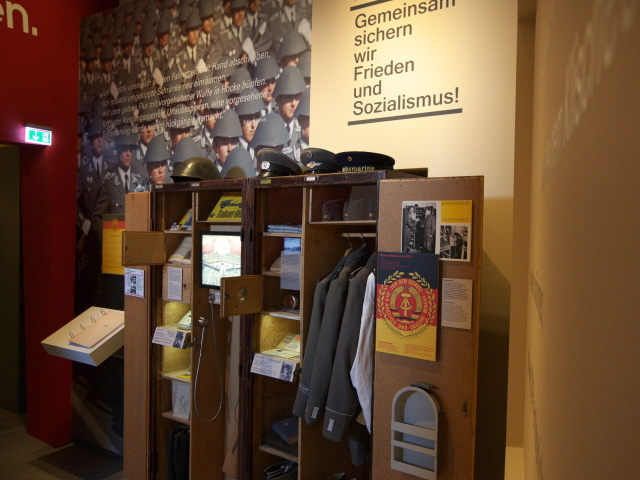 Upstairs, the main part of the exhibition looks into topics such as the military of the GDR (NVA) and what the general draft meant for the young. Also emphasized are the roles of the media, the workplace, family life, youth organizations, fashion, GDR products, and so on. In addition to plenty of artefacts, documents and photos, there are also interactive screens on which you can play videos of documentary footage or feature film clips related to the various topics (these are also available in English). The contradictions between the official promises made and the reality of life under this system are often of an almost tragicomical nature. For instance pleas like “Arbeite mit! Plane mit! Regiere mit!” – roughly: 'Take part in work, in planning and in governance!” – must flown in the face of reality for most people, who had no way of influencing their authoritarian government. The very darkest sections in this museum, predictably, are those about the police and, especially, the Stasi, the GDR's infamous internal secret service. Amongst the exhibits here are spy cameras, microphones with which telephones were bugged, or glass jars with those notorious “scent samples”. These were pieces of yellow cloth that carried the scent of suspected enemies of the state (taken from them during interrogations) and which were archived and (potentially) used to train sniffer dogs on them. You can see specimens of this very characteristic type of Stasi exhibit also at the Stasi Museum and the Stasi exhibition in Berlin. Individual cases of GDR citizens who got caught in the fangs of the Stasi are portrayed as well and include “offences” such as noting the goings-on on the Iron Curtain border, or reading the “dangerously subversive” book “1984” by George Orwell. You can even study whole files of cases, complete with the detailed reports provided by the network of internal spies. Of course for these things you have to have a pretty good grasp of German, since these files and documents are not translated. Also covered are the ways in which the people of the GDR indulged in escapism from all this oppressiveness, especially in the private sphere or by simple holiday pleasures such as camping. One of the star exhibits in this museum is a grass-green Trabbi car with a tent on top of its roof – the humble GDR equivalent of a camper van! The emergence of countercultural youth movements, such as the punk scene in the GDR (out of which the big act Rammstein would later emerge), and of course the peace movement and the church are also a topic here. The collapse of the GDR brought about by the peaceful revolution of 1989/90, on the other hand, is only superficially touched upon on the side (fair enough, since the museum is called “life in” and not “death of the GDR”). Especially lavish in contrast are the illustration of the planned economy and the nature of work in the GDR, with its collectivization and standardization as well as its systems of awards for “over-fulfilling” plans. The use of sports as a system of both distraction and a means for identifying with the state is a topic here as well. What's missing is some coverage of the many stars of the sporting world that the GDR produced (but I guess that would also not so much have fitted the “everyday life” focus of this exhibition). All in all, this is a very worthwhile addition to Berlin's various GDR-related museums. In terms of the richness of artefacts, it is top-notch, even though by floor space it is rather on the small side. It may be a good illustration of what life was like in the GDR to visitors not so familiar with the topic, although I strongly suspect that some previous knowledge could greatly enhance the appreciation of many elements of this exhibition. Yet it leaves less room for downright GDR nostalgia (compared e.g. 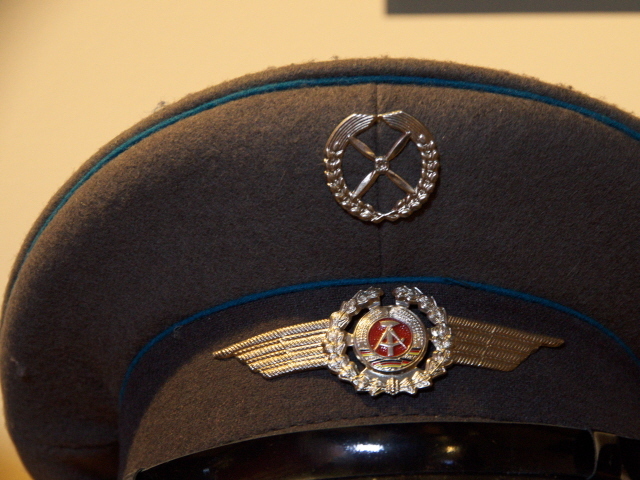 with the GDR Museum) but puts everything into a well-balanced context. Recommended. Location: at the northern end of the Kulturbrauerei complex in Prenzlauer Berg, Berlin, between Danziger Str, Schönhauser Allee, Sredzkistr. and Knaackstr. Details: To get to the museum from the centre of Berlin, the metro line U2 is the most convenient connection (leading straight up from the transport hub that is Alexanderplatz) while trams (line M10) provide access to the east and west. From the metro/tram station Eberswalder Straße, head east along Danziger Straße and turn right into Knaackstraße. The northern entrance to the Kulturbrauerei and the museum is immediately on your right. Opening times: Tuesdays to Sundays 10 a.m. to 6 p.m., open late to 8 p.m. on Thursdays, closed Mondays. Note that bags have to be stored in lockers, so better do not bring anything big. Cameras and their small bags are OK, however. Guided group tours in English or German (1 hour) can be arranged; contact: besucherdienst-berlin(at)hdg(dot)de. Time required: between one and two hours (depending on how much of the interactive and extra written material you want to study), or even a bit more if you can read German. Combinations with other dark destinations: heading west along Eberswalder Straße, the complex of Berlin Wall memorials around Bernauer Straße is the closest major dark-tourism attraction near here (about 20 minutes' walk or a short tram ride on line M10 straight to the memorial). Another branch of the German History Museum in Berlin is the Tränenpalast at Friedrichstraße station. And topically, the GDR Museum is probably the closest related other exhibition in Berlin, with a slight slant towards the lighter-hearted aspects of the GDR past. The Stasi Museum and Hohenschönhausen, on the other hand, provide deeper insights into the darker sides of the GDR. Combinations with non-dark destinations: the location of the museum itself, the so-called “Kulturbrauerei” (literally 'culture brewery') is a sight in its own right: a complex of listed buildings of 19th century brick industrial architecture that was once indeed a beer brewery. In the late 19th century it even was the largest in Germany. The complex survived WWII relatively undamaged and brewing continued in the GDR era until ageing equipment led to the plant's closure in the 1960s. But as a listed building, despite much neglect, it survived into the post-GDR period when it was finally refurbished and turned into the cultural centre it is today. For anybody with at least a passing interest in architecture it is a marvel well worth a look. In addition the cultural offerings here, next to the museum, include theatres, cinemas, cabaret and music venues, bars and restaurants, as well as various educational institutions, publishing houses and other companies (including Ch.Links – a publisher many a dark tourist in Berlin will be familiar with from their PastFinder series and other guides to dark historical destinations). The area around the Kulturbrauerei, Prenzlauer Berg, is still regarded as particularly attractive for its scene of bars, restaurants and cultural offerings, even though it has also been the subject of many a discussion about “gentrification”, since the refurbishment and modernization of the old tenement buildings, which had been severely neglected during the GDR era, led to higher price levels and a shift in the local demographic. Being just north of the central district of Mitte, many of the city's key mainstream attractions aren't far away from here either – see under Berlin in general.